The World Cup is just around the corner, and just when it seemed that India is all ready to fire its bullets in the final campaign, some of its weakness got exposed which pulled India again in a state of distress. Before the start of 2019, the form of MS Dhoni and Bhuvneshwar Kumar was a big concern but it was resolved very soon. The opening combination of Shikhar and Rohit also got into rhythm in the recently concluded 4th ODI at Mohali. But the one spot which was most talked still remains in a state of question. India still has not got a permanent solution of that No.4 slot. In last 11 games, India had shown its utmost faith on Ambati Rayudu. He delivered on a few occasions but most of the times he failed and even failed miserably. He has a string of low scores during these 11 games and has left India in a doubt regarding that position. In last game against Australia Virat Kohli himself tried batting at No.4, but could not execute well. If we take a look over the stats of post the 2015 World Cup then there have been few cricketers who had done the job at No.4 considerably well, but were overlooked. A few of them deserved more chances than they were given. 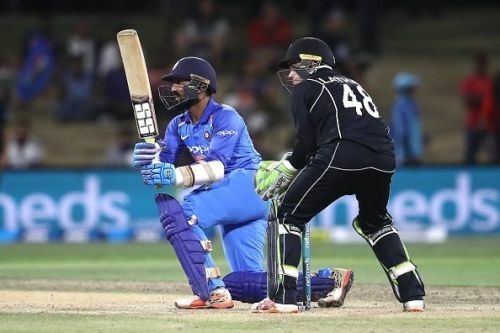 Dinesh Karthik was given a national call after some stupendous knocks in the domestic circuit. He made a comeback in the squad at the time of Champions Trophy 2017 and since then he was there with the team but as a second fiddle player. He was not invariably featured in the playing 11 but whenever he was, he played some fantastic knocks. Be it the Nidahas Trophy final or the finisher role in Adelaide against Australia, he always impressed the selectors. He was even tried at No.4 few times and out of 9 matches that he played at No.4 position he scored 264 runs at an average 52.4 and strike rate of 71.35. Thus it can be said that the Tamil Nadu batsman deserved a few more chances to prove his mettle. Why not Pujara at #4 in ODIs going into the World Cup?